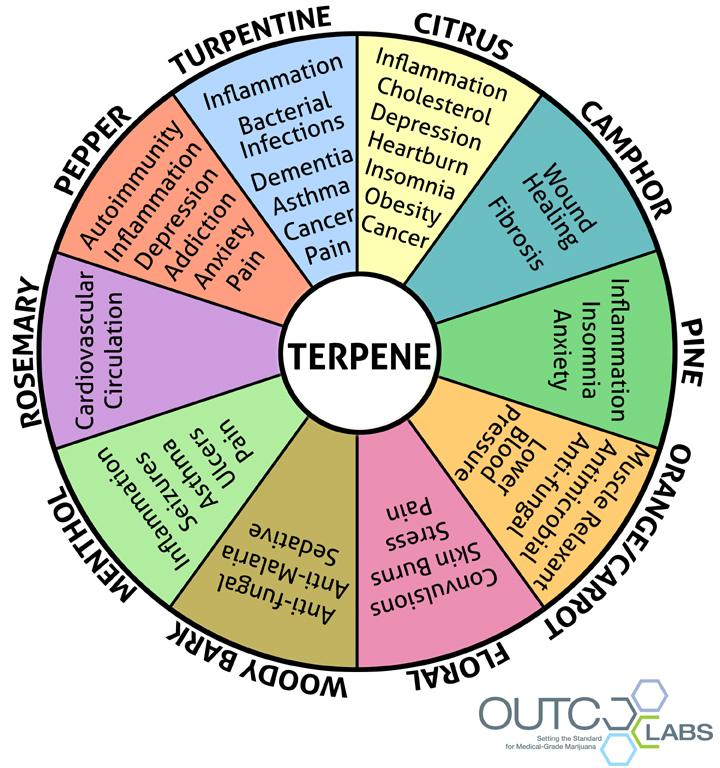 Terpenes make up the fragrant smells of cannabis. 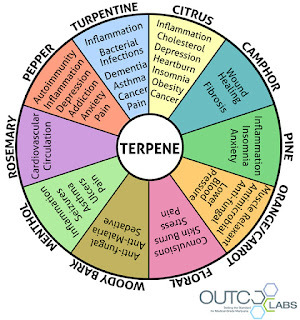 Each terpene has a distinct odor and specific therapeutic properties. By smelling the cannabis flower, you may be able to figure out what treatment it provides! Alpha Pinene – Gives off a pungent turpentine odor; reduces THC psychosis effects in cannabis. Beneficial as an anti-inflammatory while reducing pain. Helps bacteria infections, asthma, memory retention, and also slows cancer tumor growth. Borneol – Has a camphor smell; helps with wound-healing, including fibrosis. Aids in delivering treatment by improving absorption through the blood-brain barrier. β-Caryophyllene - Has a peppery scent; cannabinoid effects the CB2 receptor to help with anxiety, inflammation, perception of pain, autoimmune disorders, and depression. Acts as a neuroprotectant and reduces alcohol consumption. Cineole \ Eucalyptol – Smells similar to rosemary with notes of spicy camphor; increases the absorption and circulation of medicine. P-Cymene – Has a fresh, carroty odor that is antimicrobial and anti-fungal; helps to relax muscles, including cardiac muscles, which can lead to lower blood pressure. Delta 3 Carene – Gives off a pine scent; acts as an antihistamine, eliciting a calming feeling to aid in well being. Has anti-inflammatory properties and acts as a nervous system depressant; serves as a great complementary treatment for anxiety and insomnia. Isopulegol – Gives off a minty menthol smell; also has a cooling effect, anti-oxidants, and anti-inflammatory properties that help with breathing, pain, ulcers, and seizures. Limonene – Has a strong citrus scent; works like a cleanser to dissolve gallstones, reduces reflux/heartburn and cholesterol while destroying cancer. Is an anti-oxidant, anti-carcinogenic, anti-inflammatory while detoxification properties help the liver. Improves mood, weight management, and sleep. Linalool – Releases a spicy floral fragrance; reduces stress, pain, convulsions, and treats burns. Nerolidol – Has a woody bark smell; acts as a sedative. Absorbed through skin to aid topical medication. Has anti-fungal properties while reducing malaria infections.